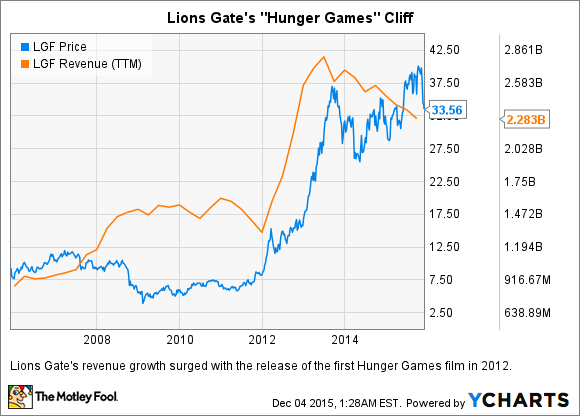 Can Lions Gate Entertainment Corp. Survive Without "The Hunger Games"? Should you buy Lions Gate even though its top franchise just ended? Shares of Lions Gate Entertainment (NYSE:LGF-A) have slipped nearly 14% over the past month, even though its final Hunger Games film generated solid box-office returns. To date, The Hunger Games: Mockingjay Part 2 has grossed over $450 million worldwide on a production budget of $160 million. Unfortunately, those numbers were weaker than last year's Mockingjay Part 1. The end of the blockbuster series also means that the studio faces an uncertain future with less profitable or unproven franchises. Let's examine these headwinds and see what Lions Gate's future looks like without Katniss Everdeen. Lions Gate carved out a profitable niche over the past few years with film adaptations of popular YA (young adult) book series like Twilight, The Hunger Games, and Divergent. The five Twilight films grossed $3.3 billion, the first three Hunger Games films made $2.3 billion, and the first two Divergent films have raked in $586 million worldwide. Lions Gate's formula convinced many larger studios to adapt other YA books into movies with mixed results. Two years ago, Time Warner (NYSE:TWX.DL) adapted Beautiful Creatures, but the film only grossed just $60 million on a production budget of $60 million. The following year, Fox (NASDAQ:FOX) released the first Maze Runner film, which fared much better by grossing nearly $350 million on a budget of $34 million. Since Lions Gate is much smaller than Fox and Time Warner, it sells the international distribution rights to its films in advance. For example, it sold the international rights to Divergent for $70 million, which covered most of its production costs. While this means that Lions Gate pays very little of the film's production costs out of its own pocket, it also limits the maximum amount of overseas revenue that it can generate. Marketing costs and splitting ticket sales with theaters further reduces that overall profit. Last quarter, Lions Gate's motion picture revenue fell 11% annually to $354 million and accounted for 74% of its top line. Total revenues fell 14% to $476.8 million, which missed estimates by $14.2 million. The studio blamed that decline on the mediocre performance of American Ultra and Shaun the Sheep. It also announced a $7.2 million writedown on The Last Witch Hunter, which was released after the quarter ended. These missteps indicate that Lions Gate's non-YA franchise films aren't strong enough to stand on their own. That's why nearly half of the studio's release schedule over the next few years includes sequels or potential franchise films like sequels to Now You See Me and John Wick. It also acquired the rights to Chaos Walking, a popular new dystopian series, and is trying to reboot the Power Rangers with a new film. In the fourth quarter, Lions Gate will release the next Divergent film, Allegiant, which will serve as its main tentpole. It will also release the fantasy film Gods of Egypt and the comedy Dirty Grandpa starring Robert De Niro and Zac Efron. Lions Gate realizes that its recent box office performance and slightly delayed release dates for upcoming movies will affect its bottom-line growth. During last quarter's conference call, CEO Jon Feltheimer reduced his adjusted EBITDA outlook for the period between fiscal 2015 to 2017 by $100 million to a range between $1.1 billion and $1.2 billion. No one is sure how Lions Gate will fill the void left by The Hunger Games, but investors shouldn't overlook the studio's other opportunities. Its television production unit, which produces and delivers series like Orange Is the New Black, Nashville, and The Royals, accounted for over a fourth of its top line last quarter. Although the unit's revenue declined nearly 7% annually last quarter due to the "timing of episodic deliveries," Lions Gate expects the unit to "drive revenue growth in the second half of the year" with new shows. There are also reports that Lions Gate might launch or license Hunger Games theme parks in the future to keep the franchise alive. There are also rumors that Lions Gate could produce a new prequel Hunger Games series, similar to Time Warner's upcoming Harry Potter spin-off trilogy, Fantastic Beasts and Where to Find Them. Meanwhile, Liberty Global and Discovery Communications (NASDAQ:DISCA) agreed to buy 6.8% of the studio after its weak second-quarter earnings report. Those new positions fueled speculation that Lions Gate could eventually be acquired. Lions Gate rallied almost 360% over the past five years thanks to top YA film series like Twilight and The Hunger Games. But looking ahead, it faces tough year-over-year comparisons as the market becomes saturated with similar films trying to re-create comparable results. For the time being, investors might be better off sticking with more diversified media companies like Time Warner instead of smaller ones like Lions Gate.